To celebrate the launch of our new umai brand, we are giving away some cool Japanese gifts this weekend. 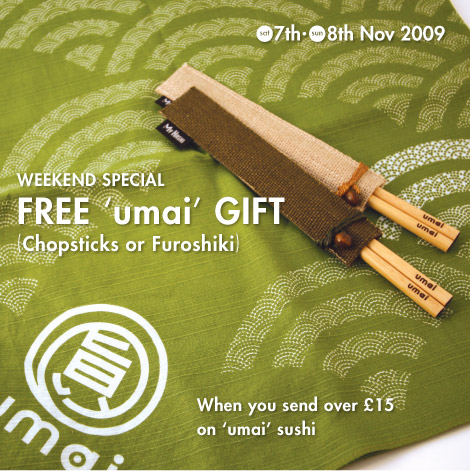 Spend over £15 on umai sushi and you can choose either a set of chopsticks, or a Japanese furoshiki eco shopping bag, absolutely free! You can check out our chopsticks and furoshiki items on our products page. This promotion is only available on Saturday 7th and Sunday 8th November while stocks last, so come to our shop, grab some tasty sushi and get a free present, it’s a win-win situation!